Dr Kim Naudts, postdoctoral researcher in the department "The Land in the Earth System" at the Max Planck Institute for Meteorology (MPI-M), has accepted an assistant professorship at the University in Amsterdam (VU). 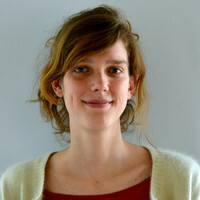 She will be Assistant Professor in Biogeochemical Cyles as of April 2019, but she will keep a close cooperation with the Emmy Noether Independent Junior Research Group "Forest Management in the Earth System" at MPI-M.
Kim Naudts studied and received her PhD in Ecology at the University of Antwerp in Belgium. Afterwards, she worked as a postdoctoral researcher at the Laboratory for Sciences of Climate and Environment in Paris. Kim Naudts was part of the Emmy Noether Independent Junior Research Group "Forest Management in the Earth System" at MPI-M since April 2015, investigating the interactions of land use change and climate. Deforestation is known to have a distinct impact on global climate, but more subtle changes in the vegetation cover through, for example, forest management have received far less attention. "Yet, land-use changes can have similarly large effects on carbon and energy fluxes as deforestation," says Kim Naudts. With the use of Earth system models, Kim Naudts and co-workers have revealed that historical management decisions like massive conversion of deciduous trees to conifers have consequences for regional near-surface temperature. However, in regions with intensive forest management like Europe, climate benefits achieved through forest management might be modest due to the compensating effects of increased carbon sequestration and coinciding unintended changes in the lower atmosphere. In the Earth sciences department at the VU, Kim Naudts will extent this type of research by exploring the role of forest management in climate change adaptation. "The primary role of forest management may not lie in protecting the climate, but in adapting the forest cover to future climate to sustain the provision of wood, as well as ecological, social, and cultural services by avoiding damage from forest fires, storms, pests and summer droughts." More specifically, future work will involve using first principles to improve the ecological realism of land surface models to gain a better understanding of the impact of land management on natural disturbances.